The final par of compulsory basic training (CBT) is element E and will now see you riding on public roads and dealing with traffic in real-time. Element E will only start when your trainer is confident that you have understood everything in all previous elements and that you are able to handle the motorcycle. During element E you’ll be accompanied by your trainer at all times and will be in constant radio contact. During this on-road element, you may also be accompanied by another trainee. Element E will last for a minimum of two hours, though longer may be required for some CBT candidates to ensure each rider can ride independently and safely. Whilst riding, you’ll be covering a variety of topics detailed in this section. Your trainer will occasionally stop you throughout Element E to discuss a particular situation you are about to enter into, or to discuss areas of your riding that need improvement. You’ll cover training on many road types and various traffic systems including traffic lights. You’ll need to understand the traffic lights sequence and what you should do during each colour phase. You will need to understand how to approach traffic lights and to use an appropriate speed, to adapt depending on the weather conditions and how it can affect road surfaces, to be aware and act on road signs and to anticipate light sequence changes. For example if a light has been on green for a while, you can anticipate a phase change. Your trainer will also cover the correct use of filter lanes and how to use a traffic light controlled junction in the event of a light failure. 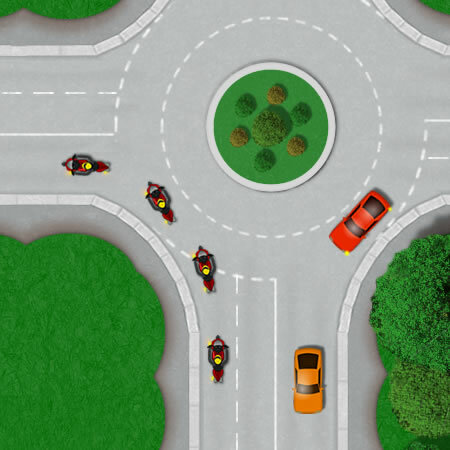 You’ll be dealing with a variety of roundabouts during CBT element E.
Roundabout come in many sizes from quiet mini roundabouts to busy roundabouts with multiple lanes. During CBT element C you will have practiced using the OSM (observation, signal, manoeuvre) and PSL (position, speed, look) routines, where you’ll now implement these routines in real-time. You’ll need to use the correct speed to approach roundabouts, use effective observation, time signals correctly and use correct lane discipline. Your trainer will take you on left, right turns and following the road straight ahead at roundabouts. As with roundabouts, you’ll need to apply the OSM / PSL routine. Junction types will vary from T-junctions, Y-junctions, staggered junctions through to crossroads. Correct use of speed is essential with all junction types as you’ll be practicing busy open junction and closed ‘blind’ junctions. Weather should be taken into account as it can make certain road surfaces extra slippery for motorcyclists. Zebra crossing – black and white road markings path the area for pedestrians to cross. Zebra crossings are not light controlled and require good forward planning to locate and act on pedestrians crossing in good time. Pelican crossings – traffic light controlled crossing. Pelican crossings have a flashing amber light allowing motorists to continue if the crossing is clear. Puffin crossings – light controlled, no flashing amber. Prepare to stop at amber and stop at red lights. Toucan crossings – crossing allows cyclists to also cross alongside pedestrians. Equestrian crossings – allows for horses to cross the road. Forward planning and anticipation is the key to judging an appropriate speed for approaching pedestrian crossings. Look well ahead for road signs, and if pedestrians have been gathering at a crossing for some time, anticipate the lights changing. The level of road gradients you’ll need to deal with is somewhat relevant to your location. 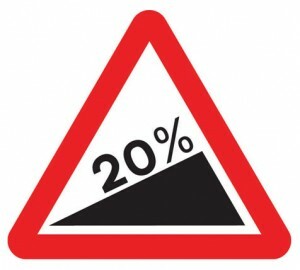 You will need to demonstrate that you can move away safely and under good control on a hill. Riding uphill and downhill will also take place during element E. Good clutch control is key to moving off uphill. Use of brakes and gears for maintaining a safe and steady speed downhill is required. Bends are generally hazardous for any vehicle. You will need to ride at a sufficient speed around a bend so that you can safely stop for any potential hazard such as slow moving vehicles, vehicles stopped and waiting to turn for example. You’ll also need a safe road position, lean into a bend and avoid hazardous road surfaces such as drain covers and road markings that can be slippery in wet weather. You will have practiced making a U-turn during on-site element C. You’ll now be required to make a U-turn on a quiet public road whilst potentially dealing with other road users. At the end of element E your trainer will have assessed your abilities. Any mistakes you have made during this element must have been recognised and remedied and you will be given certificate DL196 which means you have successfully completed your CBT. You are now able to ride solo on public roads as a learner rider based on your motorcycle category entitlement. Your compulsory basic training certificate is valid for two years, in which time you must successfully pass the theory and practical tests. Now look at our top tips on how to pass CBT.